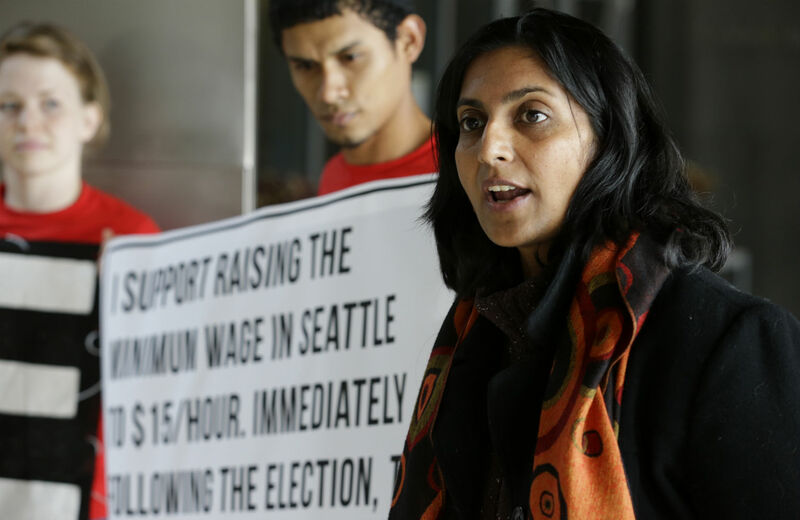 The $15-an-hour wage candidate Kshama Sawant takes the lead in a “historic” citywide race. Kshama Sawant, a Seattle socialist who campaigned on a promise to lead the fight for a $15-an-hour minimum wage, is poised to join the city council of one of the nation's largest municipalities. The sixteen-year incumbent Democrat who Sawant challenged in the nonpartisan citywide race, Richard Conlin, conceded Friday evening. The former Seattle city council president acknowledged that Sawant had defeated him after the challenger took a 1,640 vote lead in an ongoing count on ballots from the city's November 5 election. Sawant, whose campaign energized young people, communities of color and neighborhood activists to provide its come-from-behind energy, describes her electoral seccess as "historic." "Our campaign us not an isolated event, it's a bellwether for what's going to happen in the future," declares Sawant. It also renews an urban radical tradition that has deep roots. America has a rich history of radical politics at the municipal level. Over the past century has seen “sewer socialists” manage the affairs of major cities such as Milwaukee and join city councils, schools boards and county commissions from New York City to Butte, Montana. The last big-city Socialist Party mayor was Milwaukee’s Frank Zeidler, who finished his final term in 1960. More recently, Bernie Sanders served as the independent socialist mayor of Burlington, Vermont, in the 1980s; while Benjamin Nichols, a member of Democratic Socialists of America, served as mayor of Ithaca, New York, in the 1990s. And just last year, 19-year-old Socialist Party member Pat Noble was elected to the regional board of education in Red Bank, New Jersey. “I think we have shown the strongest skeptics that the Socialist label is not a bad one for a grassroots campaign to succeed,” Sawant declared as the count turned her way. Sawant won 35 percent of the August citywide primary vote and a place on the November 5 citywide ballot along with Conlin. In the officially nonpartisan race, Conlin had the backing of most of the Democratic leadership in a city where Democrats tend to win most elections; he also had the support of a number of major environmental groups. But both candidates obtained endorsements from labor organizations and Sawant won the enthusiastic support of the city’s politically potent alternative weekly The Stranger. Sawant took on not just a veteran incumbent but a political process that, for the most part, favors candidates of the two major parties and a narrow range of ideas. But just as Robert Sarvis's unexpectedly strong Libertarian campaign for governor of Virginia (where he finished with almost 7 percent of the vote) offered an indication that Americans are frustrated by the constraints of traditional two-party politics, Sawant’s democratic-socialist campaign in Seattle offers evidence that a bold rejection of austerity has significant popular appeal. John Nichols explains the growing populist appeal of politicians like Elizabeth Warren.